BACKFIRING: FED Hurting – GOLD’s CATALYST! Four months ago, right after President Trump announced his tax reform, Wealth Research Group rang the alarm about the fact that for the first time since the Great Recession, the agenda of the Federal Government and the Federal Reserve, America’s central bank, are at odds with each other. While the Trump administration looks to make America stronger by deregulating and strengthening the domestic industries, the Federal Reserve is concerned that cutting taxes widens the deficit balance, thus causing bond yields to rise. President Trump wants the hundreds of billions in foreign cash to come home to mama and be spent internally, which is already happening. 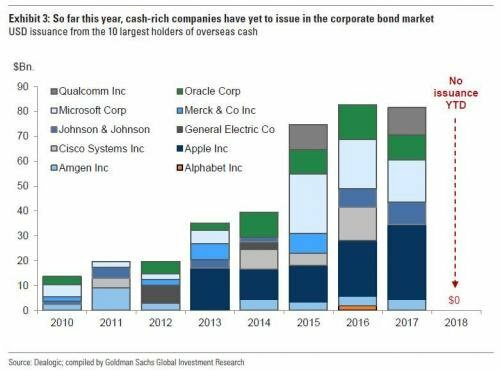 As you can see, now that these mega-businesses are cash-rich, they are not issuing debt. Instead, they are using their cash hoards to pay dividends, expand their businesses, acquire other companies, or buy back their shares. Wages will continue rising, thanks to this. But, while lower taxes and higher wages are the recipes for moving the economy forward, it also creates a situation where bond investors have no choice but to lend money to the government, since these corporations no longer need to issue debt. Bond investors are already loaded-up with Treasuries, due to years of rising prices, so they are not in a hurry to expand their allocation, especially when they know that rates are probably going to increase. Buying Stocks: This is very likely to occur because the dividend yield is still attractive, and some world-class businesses are still fairly valued, but since the 10-year bond is yielding 3%, investors will become very selective, meaning that prices might have to come down further to attract buyers. Put differently, stocks could be trending down or flat for a while. If yields come back down, expect the market to rally big, though. Holding Out: A likely scenario is that the bonds market stays frozen, so that big money remains in cash for a while, making the USD technically stronger for the short-term. In this scenario, we’ll experience a correction in commodities prices, before high inflation numbers spook investors, triggering a rally in commodities towards Q3 and Q4 of 2018. Diversifying: This is what Bond God, Jeff Gundlach, is predicting. He sees bond investors rushing into gold, since the deficit spending has a major inflationary impact on markets, so he doesn’t believe bond yields have much room to go here. Therefore, real interest rates (yields minus inflation) will stay in the right range for precious metals. Russia is a major bond buyer, but it is voting with its wallet. 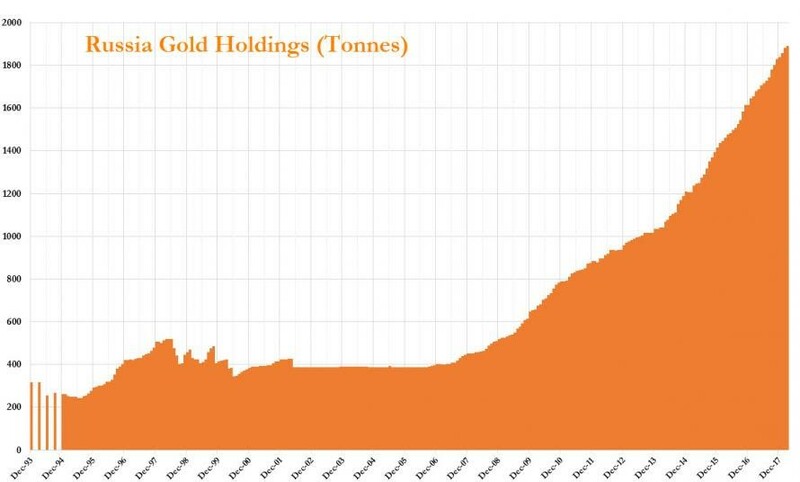 Their gold hoard is substantially growing, because they fear sanctions. Wealth Research Group sees a combination of all three scenarios coming to fruition, then. What we’re looking at, mainly, is the FED’s reaction to high inflation stats. If they double-down on tightening, hiking by 50bps, instead of their conservative 25bps, then stocks and gold would rally together for a while, but then stocks would sell-off in fear that the Central Bank might not be under control of the economy – commodities will explode. Another potential outcome is that the FED halts their tightening plans, which will cause confusion and keep investors in cash, liquid. The next FED meeting will be critical and will determine how investors trade in 2018.